The author of the wonderful Everything I Never Told You returns in a new tale of suburbs gone wrong. In placid Shaker Heights, Ohio, the placid house of the Richardson family is afire. Lexie, Trip, and Moody were all away from home. Mr. Richardson is at work, of course, and Mrs. Richardson woke up in plenty of time and she’s fine. No one knows where the youngest daughter, Izzy, has gone. 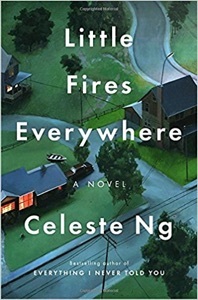 Like Ng’s first book, Little Fires Everywhere argues that parents don’t know their kids. Sometimes languorous, this book is beautifully designed and told.